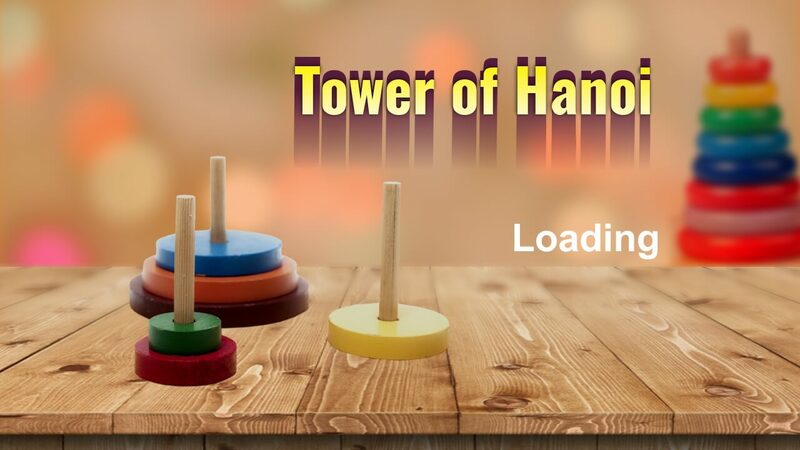 The main challenge in Tower of Hanoi was to implement functionality for the user to pick up a ring from a pole, move to focus area of the desired pole, and place it there. But after grilling our brains around, we finally achieved the flying colors. Then came the thrilling logic to reserve and hold user’s best score and time. It was a bit complicated in the beginning, but we were able get through that. Initially, we affixed the root game board design, which can be called as the playground. User can select the number of rings (at-least 3 and at-most 10) by using the ring selector. Basically the user has 3 poles. First holding the selected rings, middle pole as a helper pole, and the last one as the target pole. In short, getting the EXACT replica of the ring pattern from 1st pole to the 3rd pole in proper order using the 2nd pole, is the total work-around the game. It was a sound implementation for the people awaiting to grill their brains with some logical salt and spices, to solve the most amazing puzzle – Tower of Hanoi.